A slightly lengthened course was much slower than previous years due to the "heavy" conditions underfoot. Ian Holmes was beaten into 2nd place by Salford''s Andi Jones, 39:05. Every runner (430+ of them) enjoyed a bottle of Briscoes Brewery auld lang syne ale. Jamie Hutchinson reports ... The Coley Canter took place on Tuesday 28th of December starting from Shelf near Bradford (Calderdale Relay leg 5/6 c/o). It was a very wet and muddy (I think the canter refers to the livestock that had been over the fields before us!) 7 miles and 1000ft climb trail race. It's a quick start downhill for several miles and then a grind back uphill for several miles. I managed to get round in about 49 minutes and finished tenth out of about 80 ish runners. Quite a few juniors out too - results on the Junior results page. Thanks to Richard Gray for organising this. Approx 5.6M/9km Vince Gibbons won a bottle of fine wine. Calderdale! 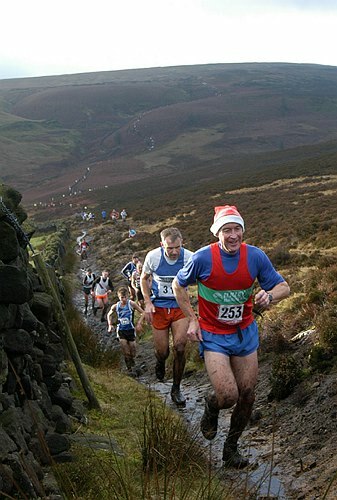 It's the biggest fell relay of the year, and a real toughie. Ilkley fielded 3 teams: a Ladies team and two Open teams. The BIG NEWS is that our ladies team won - a first for Ilkley Harriers. Indeed the performances were so strong that they beat the mass start at all checkpoints, a first for Ilkley ladies and possibly a first for any ladies team? On Leg 2, Roy Ruddle and Eddie Winslow ran 76:42 to bring us in 39th. Emma Barclay and Sally Malir stormed the leg - their 70:14 was 6 minutes quicker than last year, 30th fastest team on the leg, and most importantly made Ilkley first ladies team with over 5 minutes lead. Dennis Ackroyd and Paul Wood ran 78:50 to bring us up to 60th place overall: and all our teams beat the leg 3 mass start. Leg 3, and Nick Pearce and Mark Iley ran 47:29, losing a little time getting lost, and swapping places during the course with our ladies pair of Rahel Friederich and Joyce Marshall who had run a good leg, 37th fastest team, in 46:26. Barbara Bullock and Heather Maud ran 58:08 to bring us in 71st, and again we all beat the mass start! Leg 4 is one of the legs where clubs play their strongest runners, and Jim Ryder and Jamie Hutchinson ran hard to bring us in about 76 minutes (the results are wrong here). Andrea Priestley and Helen Sedgwick ran 82:22, keeping 7 minutes clear of the next ladies team Holmfirth. Alas the B team's gallant battle against the mass starter failed here, Ian Marshall's and Ashley Hardwell's 83:18 bringing them in just after Ed and Susie had been set off. Subject: Stockport 10 "Road Race"
Course:  Very hilly with 2 mile of trail! The Ilkley Harriers Runner of the Month for November is Emma Barclay - click here for details. Geoff Howard reports ... Caroline and I ran the Nene Valley 10 mile race today (perfect conditions with the only "hills" being four road bridges and two underpass exits) coming 113rd in 69:29 and 39th in 61:35 respectively in a field of 322. The ladies finished 4th team on the day, and a superb 3rd overall in the series: Alison Bennett was 15th in 23:34; Helen Sedgwick 21st in 24:00; Sally Malir 22nd in 24:12; and Elizabeth McCann 38th in 26:28. Helen was 5th lady in the series; Cath Wolfenden 6th; and Alison Bennett 4th lady vet. Earlier in the day the U13 girls were 4th ... more. A BIG 10k race, with some 4,000 runners, and very popular for its fast course. Final results are: 133 Jamie Hutchinson 36:43; 229 Neil Chapman 38:22; a great result for Cath Wolfenden 234th in 38.27, (a PB by 1min30) beating most of our men and 17th in her class; 251 Dave Jepson 38:40; 261 Mark Iley 38:51; 309 Ewan Welsh 39:27; John Woodward 552nd in 42:18 coming back to form; 668 Andy Wolfenden 43:34; a great result for Suzanne Bickerdike 902nd in 45:39 and a PB by 2 minutes; 979 Vince Gibbons 46:15; 985 Jeff Paget 46:16; and 1151 Jane Bryant 47:34 having a good run; and 1646 Susi Leach 51:13. This is a Harriers Running League counter, won in 29:43 by Altrincham's Andrew Norman. (not Saturday 5th February as advised in the newsletter). Andy Wolfenden reports ... My journey across the divide in search of a fast time on this flat course proved in vain. The weather did not help, with a wind as raw as a baboon's bottom making warming up beforehand almost impossible. But no real excuses for my rather disappointing 160th place in a time of 1hr 13m 27sec. The race was won by Sale Harriers' Rick Hayman in 53.22. Neil Chapman reports ... A few junior Harriers and myself tackled the Roundhay races today, in extremely cold and damp conditions. In the three mile race James Wardman ran around 19:25 to finish 6th overall and 1st in U16, with Simon Chapman finishing in 22:35 and Bradley Chapman running 24:45. Josh Atkinson arrived expecting to run a one mile race, and responded well to the challenge of three miles, finishing strongly in 28:34. All the Juniors ran PBs for that distance. I tackled the 5 mile race, after completing the 3 mile race with Bradley, finishing in a rather dissapointing 32:16. Perhaps my future lies in pacemaking 10 year olds? Thanks to all the organisers, marshals, and helpers who helped make our XC event a great success today. We managed to get 2 men into the top 100: 79 Jim Ryder 36:46; and close behind him 82 Jamie Hutchinson 37:00 (Ian Fisher won in 30:45 for the 9.6km course, and 2nd-claim Harrier Jason Hemsley was 35th in 34:22). Then we had: 113 Mark Iley 38:35; 125 Geoff Howard 39:22; 142 Ewan Welsh 40:36; 148 Iain Mann 41:07; 151 Neil Chapman 41:16; 176 Paul Wood 43:15; 184 Steve Cockerham 44:30; and 194 Andy Kitchen 48:01 - 15th team. Earlier, our U13 Girls team was 6th ( more ...) . AL 17M/4250' Jo Foster reports ... Won by Paul Thompson (Clayton Le Moors) in 2 hours 20 51 seconds! 4 Harriers turned out - cold, crisp, beautiful day. Roy Ruddle was 39th in 2.55.34 (some 1h51mins faster than 2002! ), Nicky Kime was 53rd and 3rd Lady in 3.05.12, Mike Baldwin was 54th in 3.06.19 and Jo Foster was 73rd (6th Lady) in 3.22.56. Struck me how different fell racing is from road running in that in the course of the race I managed to lose a shoe in a bog and fall over about 5 times (good job I'd decided not to wear the short skirt to the FRA do in the evening as the knees are ruined! )- this never happens to Paula Radcliffe!!! Amazing to see how some very muddy people could spruce up well for the FRA presentation and dinner in the evening at Kendal! Amanda Parnby reports ... Shane Green ? but possibly first !! 28th Richard Midgeley 4hrs 10 min Suzanne Bickerdike 4hrs 25 min Barbara Bullock 4hrs 35min Roger Pyle 4hrs 37min Amanda Parnaby 4hrs 43min Jamie Hutchinson and Laura hiked it. Roger and myself both had trouble negotiating a cunningly hidden peat bog and both ended up to our middles in the contents of the bog !!. The Ilkley Harriers Runner of the Month for October is Cath Wolfenden - click here for details. Andy Wolfenden reports ...A perfect day for racing saw the 45th running of what must be the most scenic 10 mile road race in the country. Despite the undulating/hilly course a strong field saw some 29 athletes get under the hour. Yours truly however, drifted in just a little after this 197th in 73.28 Nevertheless I was pleased to have improved on my previous years' times. Official results later on Keswick AC's site. BM 6.25M/1150' Jo Foster reports ... 8 Stefan Macina 47:30; 38 Jonathon Sage 52:12; 42 Mike Baldwin 52:35; 56 Emma Barclay 53:53 3rd lady; 80 Kevin Gooch 57:50; 84 Sally Malir 58:08 (7th lady); 86 Heather Dawe 58:23 (8th); 94 Jo Foster 59:18 (10th); 171 Rachael Gooch 69:31 - 209 ran. Emma, Sally and Heather got the ladies team prize. The race was won by Ian Holmes in 44:01. Sally Newman was first lady in 52:03. Times were slow due to very muddy, boggy, wet conditions. Iain Gibbons reports ... Just thought I’d let you know about my race at the Summit Inn, Littleborough CS 4M/800’. A steady climb with a disappointing downhill. Never the less good experience and a run out. I came 23rd in 33:04. There were many Harriers competing in various courses on the 2-day Karrimor International Mountain Marathon, a pairs event navigational event with a high-level overnight camp. Heather Dawe was in the second mixed team, 34th overall in 14h31:35 in the A class. 3M/800' Jason Hemsley was 3rd in 25:12; Stefan Macina 9th in 27:20 in this K & C race. For the men, it was 69 Jim Ryder 39:12; 121 Geoff Howard 41:53; 135 Dave Jepson 42:41; 142 Neil Chapman 43:03; 147 Ewan Welsh 43:17; 157 Iain Mann 43:50; and 183 Paul (that was no fun at all) Wood 46:25 - 16th team. Antonio Cardinale ran 58:03 for Otley. 55 Iain Gibbons 54:04; 56 Mark Iley 54:06; 82 Ian Marshall 56:21; 87th Nicky Kime 56:39 second lady; 110 Sally Malir 59:30 6th lady; 123 Bob Wightman 60:23; 133 Jo Foster 61:13 8th lady; 137 Paul Wood 61:27; 141 Joyce Marshall 61:50; 171 Alison Weston 64:28; 184 Ed Battye 65:50; and 199 Rachael Gooch 67:16. In the chocolate-fest at The Sun Inn afterwards, we took first ladies team prize, as well as many other prizes. Question? How long does it take a person of modest stature to weave a path through nearly 3000 runners? Answer? More than the 5 minutes I allowed for the task! Consequence? Failure to be in the right position for a fast "gun to tape" race meant that it was several minutes before I started to run properly. Of course, by then I was chasing rather than racing and did not settle with a group with the same end in mind. Result? 72nd. in 38.27 out of a field of 2936 finishers. By no means a calamity but a season's best time had been thrown away by a poor pre-race plan. Lesson? Look at the times from the previous year if you can (which I had done!) and then act on this knowledge by making sure you are in the correct place at the start in big fields (like the Abbey Dash) even if this means standing in the masses for over 5 minutes. Andy Wolfenden reports ... This race incorporated the Yorkshire Vets Half Marathon Championships. Ideal running conditions together with an interesting undulating course made for an enjoyable afternoon at the seaside. This is a popular annual event at which most local clubs are well represented. Ilkley road runners however, yet again seen as an endangered species. I was 140th in 1hr 38m 24s. Not too bad considering my lack of appropriate training. Peter Bedwell 267th in 1h54:39. On Leg 2, Mike Baldwin and Iain Gibbons finished 66th overall in 86.26; Pete Shields & Keith Wood 85th and 29th Vets team in 111.13; and Helen Sedgwick & Andrea Priestley's 86.36 brought Ilkley in as the first ladies team! The XC season kicked off with this event at Northcliffe Park. Cath Wolfenden was 7th in the ladies race in 22:30; Alison Bennett 12th in 22:53; Bridget Doherty 58th in 26:01 and Di Kitchen 59th in 26:11 - all great results in a high-quality field 100 strong. 6th team. For the men, Tim Ashelford was 44th in 36:39; then 105 Dave Jepson 40:09; 122 Ewan Welsh 40:55; 136 Neil Chapman 41:52; 155 Iain Mann 43:47; and 180 Andy Kitchen 49:02 - 16th team. This was a counter in the Harriers Running League: the men's race was won by Ian Fisher in 31:24; and second-claimers included 21 Jason Hemsley P&B 34:48 and 188 Antonio Cardinale Otley 53:51. The ladies' race was won in 20:13. The next WYXC race, at Bramley Fall on Sat 30 Oct, is also a counter. Earlier in the day. our U13 girls team was 3rd: 11th Ruth Kitchen 13:02; 13th Fiona Jordan 13:05; 15th Emily Kerr 13:17; and 22nd Alice Munnoch 13:57 - 41 ran. The Ilkley Harriers Runner of the Month for September is Jason Hemsley - click here for details. Bob Wightman says ... I ran in the 8 mile Bronte Way today - came 63rd (again) in a time of 72mins 57secs. Slightly slower than last year but this year was into a strong headwind. Jim Ryder reports ... Jason was 7th in 47:27 and I was 13th in 51:01 - results on ogdenwater site. Interesting race as after the first checkpoint it's any route to CkPt 2 then any route home! Following others doesn't really help as there are so many route choices. Everybody just scatters. I followed a Calder Valley runner who took an 'interesting' route by finding another hill to climb. It's supposed to be down hill from the finish! Neil Chapman reports ...Junior Ilkley Harriers were well represented in the Harewood Hop 2 mile junior race, with nine runners tackling the course which has a tough hill to finish. First Harrier home was new member James Wardman in his first race for the club finishing 10th in 14:33, with Dan Roebuck hot on his heels 11th in 14:39, and Simon Chapman 20th in 15.43. Then came the family battle between Catherine and Mary Gibbons, finishing 28th & 30th in 16:22 & 16:27 respectively, but both finishing 1st in their age groups. Patrick Gibbons was the next Harrier in, 43rd in 17:40, just ahead of Bradley Chapman 45th in 17:55, with Kieran Roebuck 86th in 20:34 and Eileen Gibbons finishing well 111th in 22:19. In the senior 10 mile trail race, which is enjoyable to run in pleasant traffic free surroundings, first Harrier was 50 Dominic O'Hooley in 67:41, followed by 61 Neil Chapman in 69:10. Then came a group of Harriers with Keith Wood 81:34, and 329 Vince Gibbons 84:14, with 363 Helen Shew having a good run in 86:08, just ahead of 367 Barbara Bullock 86:17 and 2nd claim Harrier Antonio Cardinale 374th in 87:44. Amanda Parnaby came in 552nd with a strong finish in 100:10, slicing more than seven minutes of last years time. Paul and Dennis soon had Emma Barclay and Sally Malir breathing down their necks, and were passed on the climb to Angle Tarn, but then Emma and Sally went on to finish 1st ladies team on the leg in 46:01; the valiant Vets running 49:19 to open up a little ground on the Open team of Ted Battye and Ewan Welsh who ran 52.15. Alison Weston and Jo Foster ran a blinder on the final leg making full use of Alison's mountain navigation skills in the filthy weather on top: their 72:24 brought them in as first ladies team in an overall time of 4h57:02- 8 minutes clear of the next ladies' team. All the Harriers teams were well placed (31st, 43rd, and 45th) in what is the top fell relay in the country. Thanks to Morgan, Emma, and Sally who arranged and rearranged the teams, the many drafted-in runners, and the supporters out there on the day. Terry Lonergan reports ...A SMALL BUT SELECT GROUP OF ILKLEY HARRIERS IGNORED THE FORECAST OF GALES AND HEAVY RAIN TO TACKLE THE 2OTH. RUNNING OF THE HORSFORTH 10K. THE GOOD NEWS? THE FORECAST WAS WRONG AND CONDITIONS WERE FAVOURABLE; COOL AND BREEZY. HOWEVER, THE COURSE WAS MADE EVEN HARDER THAN LAST YEAR WITH A LATE ROUTE CHANGE ADDING EVEN MORE UNDULATION.